1. Goat at Stowe is a heart-thumping, narrow, twisty run with precipitous drops that just keep coming at you for 1,800 vertical feet. This trail, along with the very steep Star (#4), is part of Stowe’s famous Front Four. In my opinion, National and Liftline no longer qualify as they have been altered over the years to accommodate the masses, and therefore have lost their competitive edge. 2. Rumble at Sugarbush requires the dodging of trees, negotiating of bumps, stumps and jumps. For the timid, the name Rumble can be quite literal. This trail is part of the formidable Castlerock area, which is anything but glamorous. Legend has it that when installing the Castlerock chair, a bulldozer went “out of control” mowing down several hundred feet of trees as it dropped down the steep mountain. It was too steep to remove by winch, so a trail was cut to extricate the dozer from below. I don’t know if that is true, but it does make for a fascinating story, and a terrifying trail. 3. 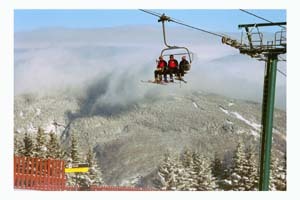 Robin’s Run represents the little sister of the double black diamond triplets at Smugglers Notch. If Stowe has its Front Four, Smugglers has three (#3, #5, #7) which share the same incredible pitch in varying degrees of steeps, knolls and cliffs. Robin’s is much too narrow with at least three cliffs. It generally has thin cover with exposed rocks and stumps making it all the more interesting. When it first officially opened, forcing the locals to share their secret, there was a 200-centimeter ski length minimum, to keep out those who did not belong here. 4. Star at Stowe initiates you from the very beginning, with a barrier fence to filter out the ill prepared. Following the initial drop of several hundred feet of super steep pitch, Star continues on as a knee grinding, back pounding run with numerous twists, turns and plenty of moguls. 5. Madonna Liftline at Smuggs’ is under the lift – obviously, making it very intimidating for the Madonna chair spectator factor. When it is open top to bottom it is 2,100 vertical feet of pure adrenaline. There are three cliff bands where you must choose your jump turns carefully, to avoid those pesky lift towers. 7. Freefall, the third of the trio at Smugglers’, is so steep that mini-avalanches occur with each jump turn. This wind-whipped 50 degree trail doesn’t usually open until mid-February, because the snow doesn’t readily adhere to such a steep pitch. This is no fall terrain, unless you are interested in a “free-fall”. The good news is there is always tons of snow at the bottom of your descent. 8. Giant Killer at Pico says it all in its name. This is the only trail on the east side off the summit of Pico The steep pitch with big, firm (usually icy) moguls presents a fierce combination. This trail has snow making which makes it and its future sibling (#9) unique on this list. 9. Ovation, located to the right of Killington’s popular Superstar as you ride the quad, is wide open and very steep and just keeps getting steeper as it descends into the Killington Basin. The avalanche affect can occur with each turn. Honorable mention goes to Devil’s Fiddle for its very steep initial drop off, located to skiers’ right of the legendary Outer Limits, which gets all the publicity as the steepest mogul slope in New England. 10. Mad River Glen makes the list, not for any one particular trail, but for all of its au natural skiing without modern grooming and snowmaking. The conditions here are completely at the whim of Mother Nature, which can make the ski experience very challenging. Hence the slogan, “Ski it if you can”. But if I had to pick one most difficult trail at Mad River, it would have to be Paradise for its steep, twisty glades. Wear your wool pants and be prepared for an adventure.